"Fried" rice, made with vegetables sauteed in vegetable broth rather than oil, is a staple meal at my home. I always make large amounts of brown rice at a time so that I have leftovers available for this and other dishes. 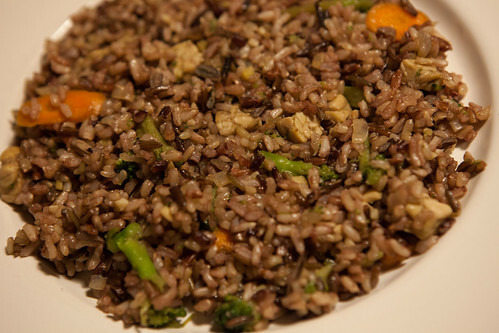 I got the original recipe from The McDougall Quick and Easy Cookbook , which calls for either instant or leftover brown rice, plus soy sauce, fresh ginger, garlic, and vegetables. I usually include broccoli and add either cashews or diced extra-firm tofu. In the dish pictured above, I used homemade tempeh gifted to me from a friend, and the same brown and wild rice blend I used in the Jeffburgers I posted previously. For years, I've used reduced-sodium tamari instead of soy sauce. This condiment is not low in sodium, however, containing 700 mg per serving. I decided this had no place in an SOS-free diet, so tried Bragg's liquid aminos, which are salt-free, as a replacement. I was concerned that Bragg's wasn't organic, meaning that the soybeans might be GMO, but figured I'd use up what I had until I figured out a better replacement. Upon further reading of the label however, I realized that these aminos, despite being salt-free, are even higher in sodium than the tamari I was using. The amount of sodium listed is 160 mg per serving, but a serving size is only 1/2 teaspoon. The 700 mg per serving of reduced-sodium tamari is for one tablespoon. Very sneaky! It would be quite easy to be fooled into thinking this is a low-sodium alternative when it is clearly not. This called to mind a great video featuring Jeff Novick, which exposes the lie of "fat-free" oil sprays, which are 100% fat and have a serving size of "1/3 second spray". While searching for that video, I happened to come across another one by him that says exactly what I just wrote about soy sauce above. Yep, labels are extremely important. I'm always especially pissed off when a "serving size" is a portion that nobody would ever eat. For instance, our company sometimes buys hot link sausages, and the nutritional information lists a serving size as 1/2 of a sausage. Come on now...who ever eats just half a sausage and goes to the trouble to store the other half for later eating? I've seen it on single snack-packages of two treats where the serving is just one of the treats, or for sandwich bread, the "serving" is a single slice. Or even worse, a microwave dinner where the "serving" is half of what you heat up...as if anybody is going to save the other portion of an uneaten microwave meal for later heating. Ick. Appreciate the agreement on serving sizes, but please don't post about sausages and other animal products on pages where the topic is explicitly about veganism. Thanks. Oops, missed that...sorry. Can take that part out and just leave the sandwich bread, treats, and microwave meals. It's OK, I'd rather leave it for continuity purposes. Thanks again for understanding. That's an eye opener. I have been buying Braggs for years and never read the sodium info on the label.